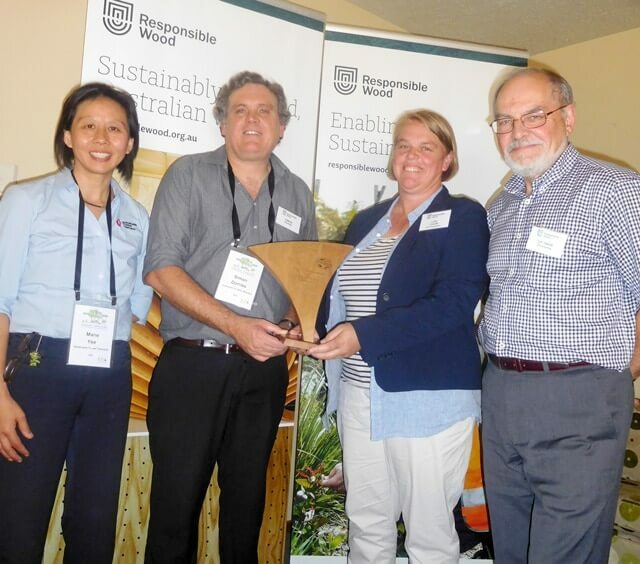 RESPONSIBLE Wood is calling for nominations in this year’s coveted Richard Stanton Memorial Award for Excellence in Forest Management. The award also carries a $2000 bursary prize. A significant and valuable contribution to sustainability. Innovation, improvement or excellence in forest management or chain of custody certification. A strong commitment to the Responsible Wood certification scheme and sustainable forest management. 2015: Dr Marie Yee, senior conservation planner, Sustainable Timber Tasmania, who helped develop a system of forest management planning which provides a high level of certainty that biodiversity is being managed effectively within the forest at a landscape scale. 2016: Mark Leech, a driving force behind Fine Timber Tasmania, a sustainability-focused, non-profit association which represents the specialty timber supply chain – growers, processors, design makers and retailers – and promotes Responsible Wood certified products. For more than a decade, Mr Leech has played a pivotal role in the development and strong uptake of RW chain-of-custody certification in Tasmania. 2017: Lou Coutts, external relations manager, HVP Plantations, based at Shelley, Vic, who is moving plantation forestry into new ground for stakeholder management, public access to plantation land, interactive websites, on-line inductions and social media. All of these actions have greatly improved HVP’s performance in stakeholder management and community relations, which has been recognised as part of the company’s certiﬁcation processes. Responsible Wood CEO Simon Dorries (left) and chair Dr Hans Drielsma AM present the 2017 Richard Station Memorial Award for Excellence in Forest Management to Lou Coutts, external relations manager for HVP Plantations. The inaugural winner of the award in 2015 Dr Marie Yee, senior conservation planner, Sustainable Timber Tasmania, adds her congratulations.